The stunning Dead Trigger FPS Zombie shooter arcade game is highly addictive and we can tell you that the Android app had a new update yesterday, we will explain a little more about this below. 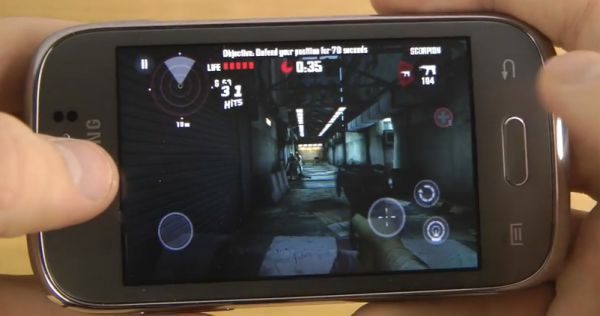 For now we want to discuss a little about Samsung Galaxy Young video review running Dead Trigger thanks to adrianisen. The Samsung Galaxy Young is not the best smartphone when it comes to specifications; it includes a 3.3-inch TFT capacitive touchscreen display with 320 x 480 pixels and 176 ppi and multi-touch. The entry-level dual SIM Galaxy Young also comes with 768 MB of RAM, 1 GHz processor, 4GB of internal storage, plus a 3.2 MP camera, this handset runs on Android 4.1.2 Jelly Bean operating system with TouchWiz Nature UX and includes a 1300 mAh battery – but how will it fair playing Dead Trigger? The good thing about the Galaxy Young is that it is cheap and the specs are not too bad considering how cheap you can get it for. The downside is the phone is a little slow and laggy and does not come with an LED flash. If you watch the Samsung Galaxy Young review video running Dead Trigger below, the smartphone seems to handle the game well. The game seems to running ok considering this is a cheap device, Adrian IsÃ©n said that when multiple zombies come at him quickly there is a little lag but not too bad overall. Please watch the video below before we spoil if for you. The Dead Trigger Android update that went live yesterday has fixed the problem with loading player’s progress on some devices, version 1.8.0 now adds new features such as – Reworked Tutorial for Newcomers, Optimized first missions to be more newcomers friendly, Improved User Interface of City Menu, Improved HUD information, a few tweaks and bug fixes to boot concludes the update. One more thing about the about is the game can now support the latest Unity 3D engine and the general stability is now improved. Watch the video below, if you do not have Dead Trigger on your Android device please get it via Google Play. If you have played this game we would love for you to send in your mini reviews in the comments.